This section of the Users’ Guide describes AlbumPlays facilities to housekeep your scrobble history. This section addresses the deletion of individual scrobbles. 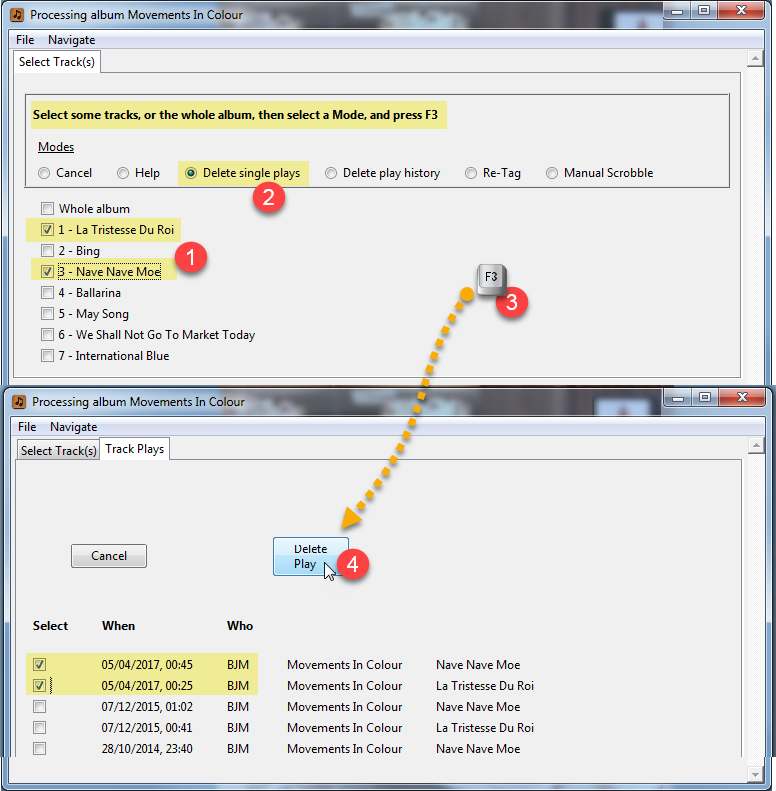 See this alternate section if you want to delete the track itself, as well as its play history. You can delete unwanted scrobbles from the MediaMonkey database. AlbumPlays database is the master source for MediaMonkey’s play history, so this achieved by deleting the scrobbles from the AlbumPlays database. Use AlbumPlay’s Edit|PlayHistory menu item to locate the track(s), and then you can display the scrobbles details for those tracks, and optionally delete any unwanted scrobbles as illustrated below. Manual scrobbles are generated for the listener from whose Last.fm account fresh scrobbles are imported. … If you have enrolled more than one listener into AlbumPlays, it is the one whose listener ID is specifed in the _user option in the configuration file for AlbumPlays. 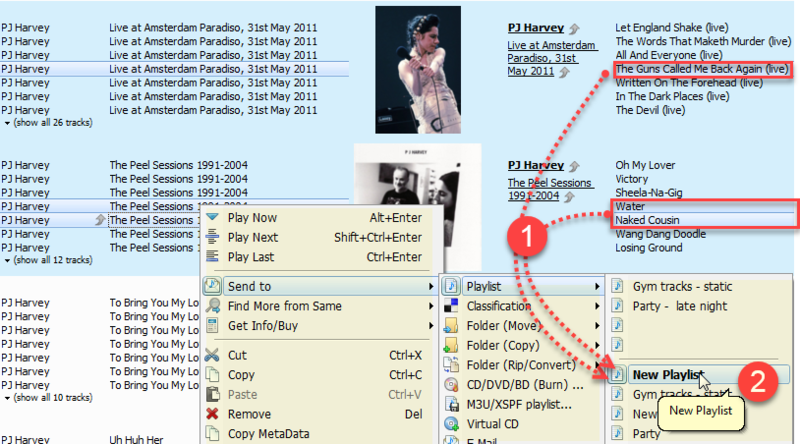 Use AlbumPlay’s Edit|PlayHistory menu item to locate the track(s) to be scrobbled. 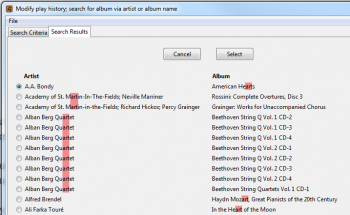 Make a selection using a fragment of the name of an artist, album, or MediaMonkey playlist. The locate by Artist or Album name options will only find tracks which AlbumPlays is aware of … if you you want to manually scrobble a track which you have never played played before, you need to use the MediaMonkey playlist option to select the track(s). The search returns the list of albums for artists containing the search fragment, as well as albums whose name contains the fragment. 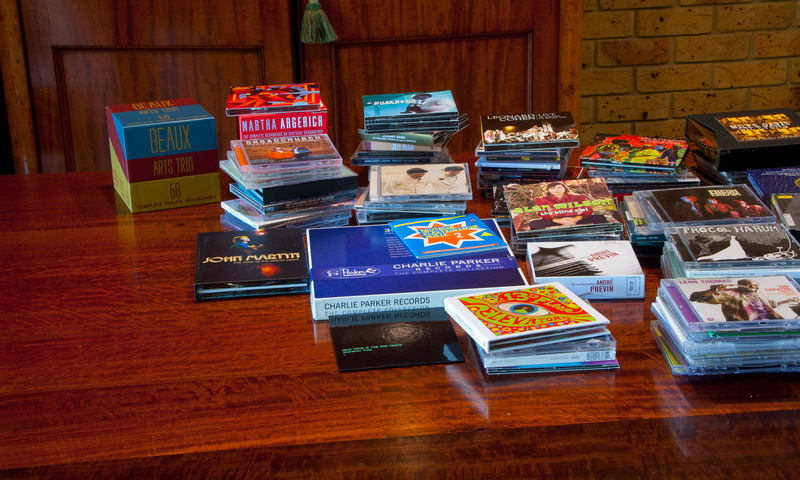 … Select one of the albums. 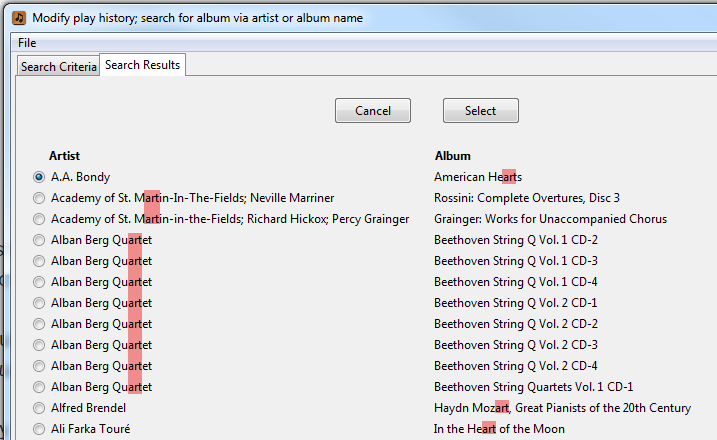 Either search method will take you to the list of tracks for the album or MediaMonkey playlist. Select the tracks that you want scrobbled, select the Manual Scrobble action, and then press F3. 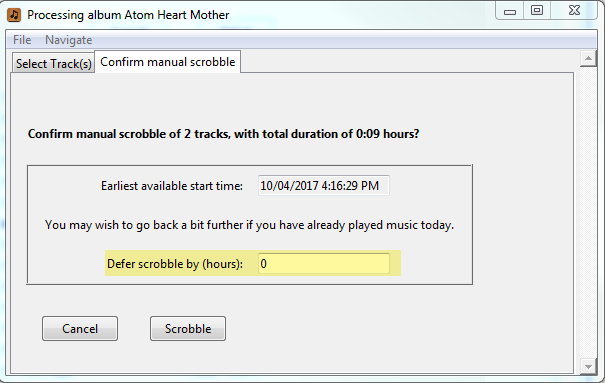 AlbumPlays will total up the play time of the selected tracks, and backdate the scrobbles so that the last will appear to have just be been played. If you have already played, and scrobbled, tracks today, you can avoid those track plays from being shuffled together with these new manual scrobbles. You do this by telling AlbumPlays to offset the manual scrobble times by n hours. … eg. say you started playing music around 8am this morning, and it is now 3pm … so you will already have scrobbles going back around 7 or 8 hours … so tell AlbumPlays to defer the manual scrobbles by 8 hours, causing them to be created into clear air, completing before today’s existing history which starts from around 8am. AlbumPlays is only aware of tracks for which you already have play history. 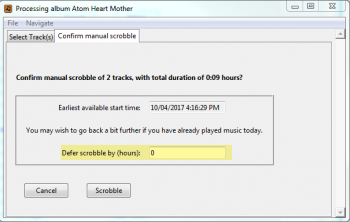 If you wish to manually scrobble a track, which you have never played before, you will need to use the MediaMonkey playlist option described above. The MediaMonkey playlist facility is also an easy way to assemble a bunch of non-related tracks, useful where you want to scrobble tracks from a mix of different albums. The authorisation procedure is described here. You only need do the 1st two steps. 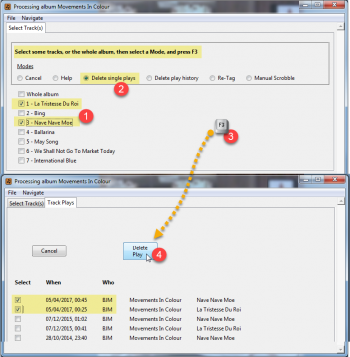 A MediaMonkey play can be the most convenient method of selecting the tracks to be scrobbled.